Artificial skin is a synthetic (laboratory produced) substitute for human skin that can dramatically save the lives of severely burned patients. Skin, composed of two layers called epidermis (the outer layer) and dermis (the inner layer), is the largest human organ. It covers the entire body, keeping harmful bacteria out and vital fluids in. The epidermis is the outer layer; the dermis is the inner layer that contains the blood vessels, nerves, and hair, oil, and sweat glands. A severe burn leaves the body dangerously vulnerable to infection and dehydration (drying out). Keeping burn patients in sterile (germ free) rooms can protect against infection, and covering burned areas with grafts (a piece of skin or bone transplanted from one area of the body to another) from the patient's own skin or temporary grafts from other humans or pigs can help save some patients. Still, many burn patients die because their bodies cannot produce large quantities of new skin quickly enough, or because their bodies reject the skin grafts. New forms of artificial skin have been tested for use on patients with skin disorders, chronic wounds, and certain forms of cancer. Synthetic skin is also being used as a human tissue substitute for laboratory animals in product research. 1970s, the two made a polymer (a chemical compound made of multiple repeating units). Using collagen fibers and a long sugar molecule, they formed a porous (full of small holes) material resembling skin. When placed on the wounds of lab animals, this material seemed to encourage the growth of new skin cells around it. Burke and Yannas then created a kind of artificial skin using polymers from shark cartilage and collagen from cowhide. This mixture was dried and sterilized to make a thin membrane (a covering through which things can pass) similar to the human dermis layer. Added to the membrane was a protective top layer of silicone that acted like the human epidermis. Burke and Yannas's experiments with their synthetic skin, called Silastic, showed that it acted like a framework onto which new skin tissue and blood vessels could grow (although these new cells never produced hair follicles or sweat glands, which normally form in the dermis). As the new skin grew, the cowhide and shark substances from the artificial skin broke down and were absorbed by the body. 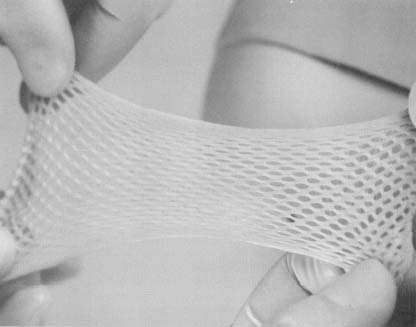 In 1979 Burke and Yannas used their artificial skin on their first patient, a woman whose burns covered over half her body. After peeling away the burned tissue, Burke applied a layer of artificial skin and, where possible, grafted on some of her own unburned skin. Three weeks later, the woman's new skin—the same color as her unburned skin—was growing at an amazingly healthy rate. At nearby Harvard University, Howard Green was culturing human skin cells under sterile conditions and growing a sheet of human epider-mis cells from just a tiny piece of a person's skin. When the cultured skin was placed on a wound area, however, it was rejected by the body's immune system (an internal mechanism for fighting off disease). Green later collaborated with Eugene Bell of MIT, who founded a research group called Organogenesis. The research goal at Organogenesis was to make artificial skin that would both include an epidermis layer and resist rejection by the patient's immune system. Organogenesis teams eventually created an extraordinary product called Graftskin, a living skin equivalent made of purified bovine (ox or cow) collagen into which some of the patient's own dermal cells are "seeded" (placed for growth). On top of this layer is an epidermal layer of cultured human skin cells. The Graftskin is formed into four-by-eight inch sheets that can be sutured (sewn) or stapled onto a patient during surgery. In clinical trials Graftskin grafts have not been rejected by patients' immune systems. Hospital trials have studied burn victims as well as patients needing skin grafts after cancer surgery, and those with chronic (nonhealing) wounds. After further testing, synthetic skin may become a more common treatment for burns and other serious skin disorders. A welcome side effect of this research is that synthetic skin is a source of human tissue that can also be used to test dermatological (skin) products without lab animals. this website helped me with my biotechnology paper!thanks! Dude, helped me a LOT with my science paper! Thnks man! At my school we have a small learning community called The Health and Medicine Academy, and for the class Advanced Topics in Medicine this really helped our group with a History of Medicine report. Thank you! i really like this paper it helped me with my essay ...but can you put info on animal testings and artificial skin usage??? Thanks, this helped with my science paper! And this is so easy to understand!!! Very interesting article. My husband is having a skin graft this afternoon and they will be using synthetic skin. Very interesting paper. We may use artificial skin membranes for our experiment. Do you know any companies where we can by them? can any one apply this artificial skin on body & where we get the artificial skin ? My name is Sylvia Rosenbloom, I'm Brazilian and I need some help. I need to know if your company have a synthetic human skin to help Brazilians in Santa Maria (south Brazil) victims of Nightclub Fire. 235 people died last Monday. I don't work at the hospital, I leave in Maryland and would like to help this people in my country. Those families don't have money to buy it. They really need to find a company to help urgent. They don't have enough skin to transplant and there is people dying one day after another, they need some to try save about 50 people. All skin they have is enough just to 7. Please, if you can help let me know. If you can not help, please let me know other companies maybe can do it. p.s. I'm sorry about my English, I hope you understand me, If not send me a phone number and I will call you soon. Thanks again. I have rumathoid vasculitis in my left lower leg. My leg including my entire calf have been eaten out to the bone and it has been very slow in regrowing new skin as it is 5 years that it has been treated. I need to know if the artificial skin is available in Ontario Canada and the name of the company that makes it, also is it approved by the Ontario health dept and does it have a Din number. Could this assist on a 33 year old water burn mark on breast area? THIS WEBSITE HAS HELPED WITH MY MENTAL PROBLEMS, THANKS! Can this product be used on a bedsore that will not heal , The store is launch as your poem in size . It is not infected on the but talks . We need urgently skin graft in Costa Rica.